Jewelry: 1910 - 1939 Art Deco. 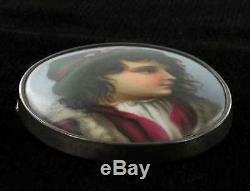 ANTIQUE HAND PAINTED PORCELAIN PLAQUE KPM BOY BROOCH. 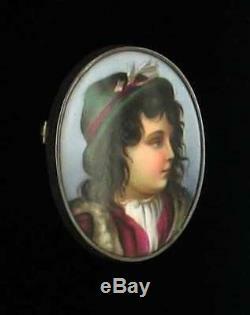 This lovely antique porcelain plaque brooch pin is painted in the tradition of the early master European painters. Features amazing detail in this portrait of the very angelic child or young boy. Painted as the European 19th century vision of Medieval era clothing. 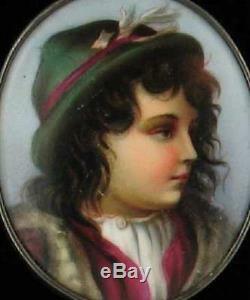 Features a green hat, and a fur vest over a white shirt and maroon tunic. This is attributed to the Berlin KPM factory. The detail to the face and hair is fabulous. The colors are very strong and incredibly life like. Framed in its original sterling silver bezel with a "c" clasp. Porcelain is impressed 6 and "E" on the back. There are the remnants of a paper label on the back. 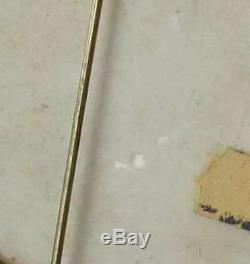 There is no makers mark but the quality of the item leads us to believe that it is in fact KPM Berlin. 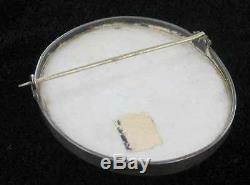 Pin measures approximately 2 1/2" high by 2 " wide. Condition to both bezel and plaque is excellent overall. There are some scratches on the the hair and scattered on the clothes. 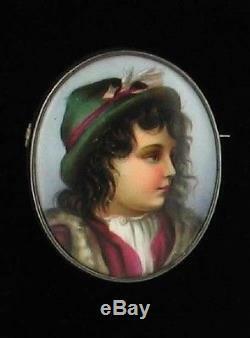 The item "ANTIQUE HAND PAINTED PORCELAIN PLAQUE KPM BOY BROOCH" is in sale since Thursday, October 29, 2009. This item is in the category "Pottery & Glass\Pottery & China\China & Dinnerware\KPM".